Hubble Space Telescope image of the ringed planet Saturn shows a rare storm that appears as a white arrowhead-shaped feature near the planet's equator. The storm is generated by an upwelling of warmer air, similar to a terrestrial thunderhead. The east-west extent of this storm is equal to the diameter of the Earth (about 7,900 miles). Hubble provides new details about the effects of Saturn's prevailing winds on the storm. The new image shows that the storm's motion and size have changed little since its discovery in September, 1994. 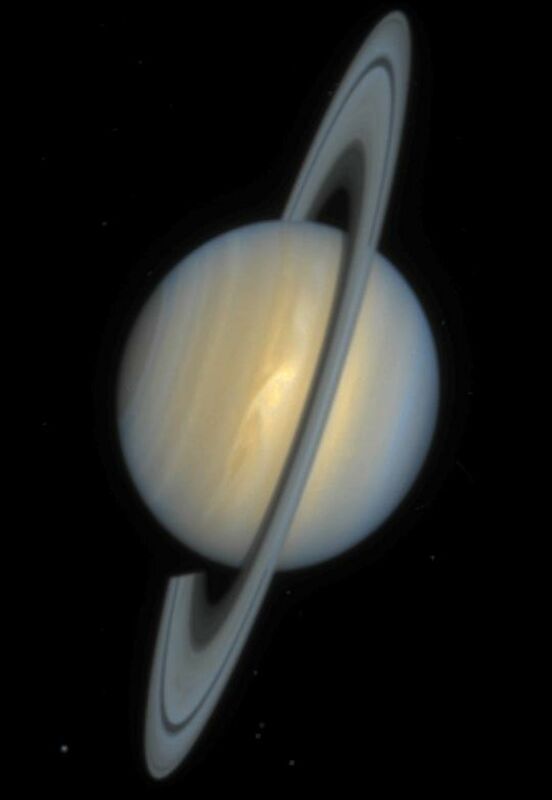 The storm was imaged with Hubble's Wide Field Planetary Camera 2 (WFPC2) in the wide field mode on December 1, 1994, when Saturn was 904 million miles from the Earth. 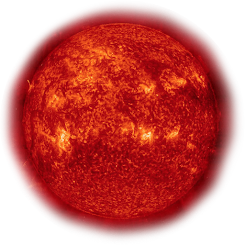 The picture is a composite of images taken through different color filters within a 6 minute interval to create a "true-color" rendition of the planet. The blue fringe on the right limb of the planet is an artifact of image processing used to compensate for the rotation of the planet between exposures. The Hubble images are sharp enough to reveal that Saturn's prevailing winds shape a dark "wedge" that eats into the western (left) side of the bright central cloud. The planet's strongest eastward winds (clocked at 1,000 miles per hour from analysis of Voyager spacecraft images taken in 1980-81) are at the latitude of the wedge. To the north of this arrowhead-shaped feature, the winds decrease so that the storm center is moving eastward relative to the local flow. The clouds expanding north of the storm are swept westward by the winds at higher latitudes. The strong winds near the latitude of the dark wedge blow over the northern part of the storm, creating a secondary disturbance that generates the faint white clouds to the east (right) of the storm center. The storm's white clouds are ammonia ice crystals that form when an upward flow of warmer gases shoves its way through Saturn's frigid cloud tops. This current storm is larger than the white clouds associated with minor storms that have been reported more frequently as bright cloud features.